October 15, 2015 By This post may contain affiliate links. 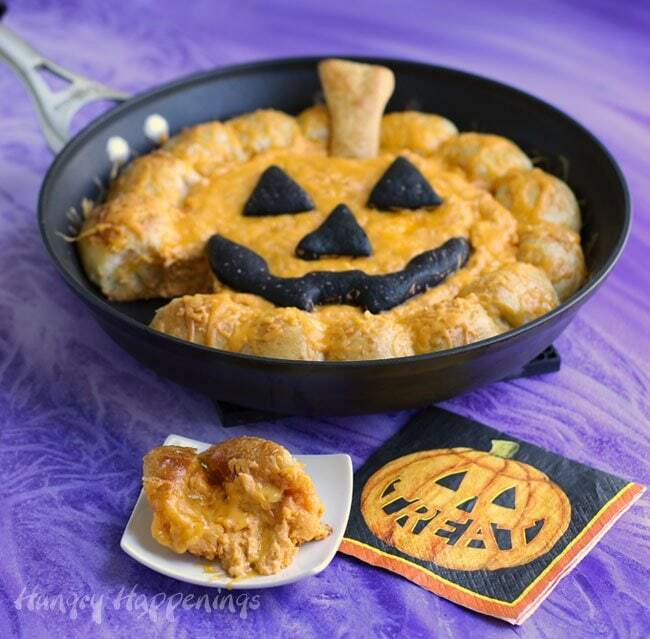 Your Halloween party guests wont be able to resist breaking off cheddar cheese-filled pizza puffs and scooping up some hot bubbly dip from this Skillet Buffalo Chicken Dip Jack-O-Lantern. This Halloween instead of serving that plain bowl of buffalo chicken dip, impress your party guests with this dip baked in a skillet surrounded with gooey cheese-filled pizza puffs that can be broken off and used to scoop up the hot dip. You can dress up the dip even further by carving some jack-o-lantern features out of the pizza crust and adding them on top of the orange dip. 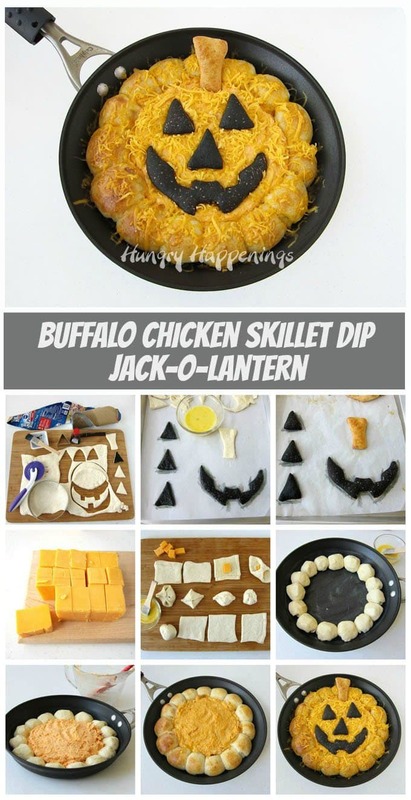 When I came up with the idea to create this jack-o-lantern dip, I was shopping at the grocery store, and being I had never made or even eaten buffalo chicken dip, I had to call my sister to ask her for her recipe. I know, it’s hard to imagine. How could I not have ever tried this popular dip when it’s been served at practically every party I’ve been invited to in the past decade? Well, my taste buds are wimps. They can’t handle the heat. Although the recipe calls for 1/2 cup of buffalo sauce, my sister uses almost a full cup in her dip. Ouch! I had to use 1/4 cup of the sauce in mine. I know, you can laugh, but I was actually able to try buffalo chicken dip for the first time and I liked it, a lot! I especially loved scooping it up with the cheese-filled pizza puffs that are baked in the skillet surrounding the dip. Any dip would taste better that way. Don’t you think? To make this quick and easy, use store bought pizza dough to create the features for your jack-o-lantern and for the cheese-filled pizza puffs. Just roll out one sheet of dough, and cut three triangles and a grin that will fit within an 8 inch circle. Cut a stem too. Set the pieces on a parchment lined baking sheet and brush the traingles and smile with black food coloring and the stem with egg wash. Bake at 400 degrees F for 12-16 minutes until the stem is golden brown. Unroll the second tube of dough and cut it into 12 rectangles. Cut three more rectangles from the first piece of dough. Brush the rectangles with egg wash, set a piece of cheddar cheese in the middle then attach opposing corners of the dough, pinch around the edges to seal, and roll into balls. Set all 15 balls of dough around the edge of the buttered skillet. Make the buffalo chicken dip, as spicy as you’d like, and spoon it in the center of the skillet. Bake for 30 minutes, remove and sprinkle cheddar cheese over top, add the jack-o-lantern features, heat for 3-5 more minutes until the cheese melts, and serve. Making this is not much harder than making ordinary buffalo chicken dip and I know your party guests are going to love it! 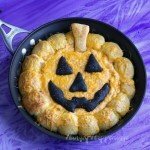 Hot buffalo chicken dip baked in a skillet surrounded by cheese filled pizza puffs and decorated to look like a Jack-O-Lantern. Unroll one tube of pizza dough. Cut out 3 triangles, 1 toothy grin, and 1 stem. Brush black food coloring over the triangles and grin. Whisk together the egg and water to create egg wash.
Brush egg wash over the stem. Bake for 12-16 minutes until the stem is golden brown. Cut block of cheese into 15 pieces. Cut 3 rectangles from the remaining dough and unroll the other tube of dough and cut it into 12 rectangles. Brush egg wash over the pieces of pizza dough. Set one piece of the cheese in the center of each dough rectangle. Attach opposing corners of the dough, then pinch around the edges to seal the dough. Pinch and roll into a ball. Set balls of dough around the edge of the buttered skillet, creating one row of 15. Mix together the cream cheese, buffalo chicken sauce, ranch dip, sour cream, 2/3 cup cheddar cheese, Monterrey Jack cheese, and shredded chicken. Spoon into the center of the skillet. Bake for 32 minutes then remove from oven and sprinkle the remaining 1/2 cup cheddar cheese over top. Add the Jack-O-Lantern eyes, nose, grin, and stem. Heat for 3-5 minutes until the cheese melts. If you are looking for more festive Halloween appetizers, check these out. This came out so cool! Great post. Perfect for a party! Pinned! Thanks, Malia. I had to make this dip twice to get it just right, but was really happy with the look of this final project. I’m glad you like it too! I love opening new fun food doors for my readers:) Thanks so much!